Cavern Keeper is Manipulator + detailed character information. 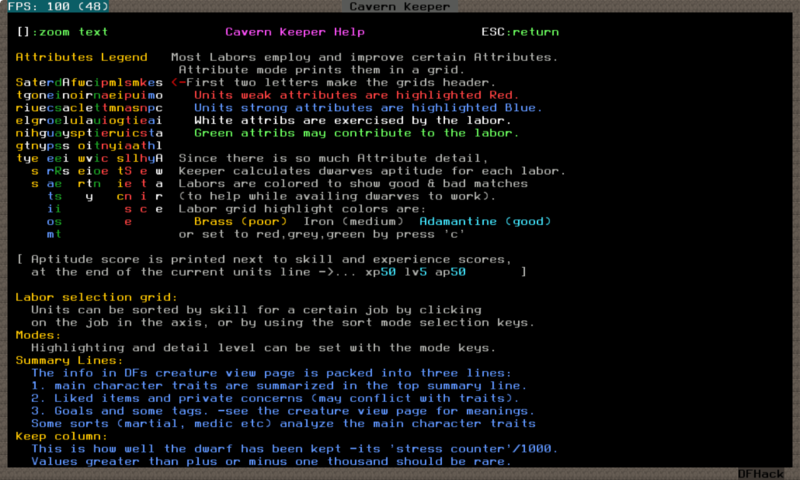 Cavern Keeper extends manipulator, Dfhack's in-game labor manager with advanced colorful display features. 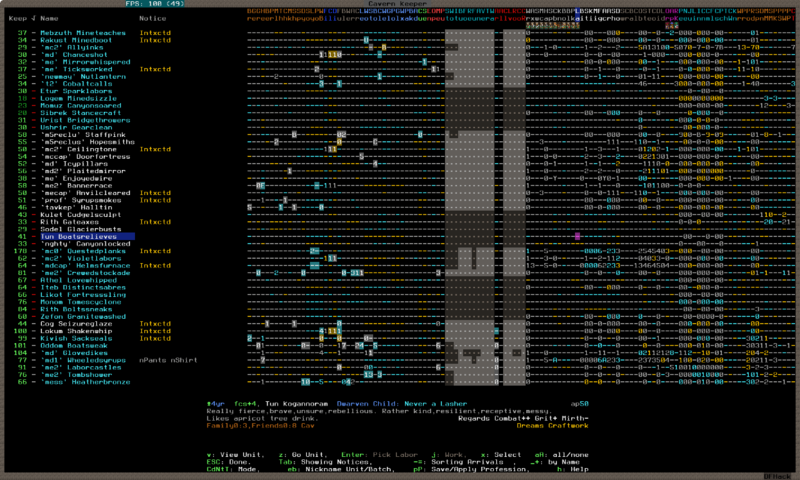 The full personalities of dwarves, pets and visitors can be quickly browsed, easily sorted into groups and subsorted. Their physical stats can be displayed, their best labors and abilities are highlighted and their conditions and problems listed. On starting a new game, the 'mode' keys set the options for level of skill highlighting, 1 to 3 lines of character summaries, name translation, color theme, werecreature & vamp notice and other cheat options. The summary lines are carefully formatted to not jump around while browsing through the list. The characters age and focus level are shown, their most useful liked items, dreams, priorities and gods. Also the characters traits are summarized in greater detail than in their long game description, using refined adjectives that indicate the in game effect of each trait. A characters mind and body attributes have a strong effect on the jobs/activities it can do best, so cavern keeper calculates "aptitude scores" and colors the activation grid to indicate the best and worst performing jobs. For the character and job in focus, the aptitude score is also printed along with experience and skill rating. See later screenshots, this cat is a bad example. Sorry, Shoo ! Next a screenshot of the post embark cheat-mode mysteriously titled "Whims of Laven". Since dwarves are much easier to assess here than in the embark preparation screens, this feature allows skill points to be redistributed, but keeps track to make sure extra are not added. Here it is on attributes tab again and redistributing the whims of Laven to make Glovedikes a better leader. This is the help screen showing the meaning of the attribute grids header. There are some more tips in the help screen but it currently needs to zoom out to show everything. Cavern keeper is not difficult to navigate. Control of sorting is simpler than manipulator, yet the sorting options are much improved. The Tab key changes what is displayed beside the labor grid (professions, squads, current activities, notices or body attributes). A couple of mode keys cycle through color and theme tweaking options, configuration and focus is persistent. All the control keys are displayed in the footer, the only controls which are not obvious are for the cheat options. psst... keep to the caverns - our labors and dreams. Re: Cavern Keeper - In game labor manager with detailed character information. Is this a plugin for DFHack? Can this plugin only be used when starting a new game? "Lagacy mode" means fortress mode I hope?  Yes its a dfhack plugin for dwarf mode - its actually the current dfhack labor manager plugin improved and can be installed on top of it (manipulator). 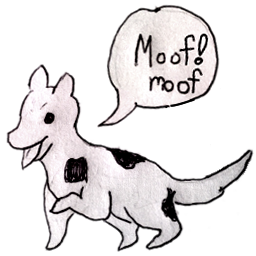 Im giving it a new name because its really improved a lot and i prefer a fantastic name. I also have to get it tested and in demand before dfhack can take it back, which is fair enough. By "legacy" mode i just meant it starts with character summaries and with labor highlighting turned off - it looks very similar to "manipulator" then. Its not just for starting a new game, although that cheatmode is designed just to be able to revise embark skills without feeling too cheaty. There is a "deeper" cheatmode that lets attributes be changed as well as skills, freely - but thats proper cheating. Being able to scroll quickly through so much info is fascinating, potentially overwhelming. The detail level can be turned down, but I prefer to see it all. Here is a big screen showing off the sort features 'group highlighting' Here the arrival groups are shown, and name, focus, skill, personality and score sub-sorts can be applied within the groups. This make it easy to review arrival groups or squads or a custom selection. I am not a programmer, so what is a .so file? Is there a place to just download the plugin already compiled to install? If you are on linux the .so file is the compiled plugin. Just save it on top of the manipulator.plug.so in that same newbie pack, then in will be accessible in the game. fraid I cant make any windows compiles at the moment. Ah, my bad... I was missing the detail that this was Linux only and was looking for a windows version. May have to fire up MINT again, this looks very helpful. Nice work. Thanks - I should have windows compiles in a week or so. I registered just to say I love this, and I'm eagerly awaiting the version for Linux 44.05-r01. Thank you! Edit: looks like it's updated on github! Thanks again! Let me know if you find any issues or things to tweak. I couldn't find the cheat mode in the new version, but that's probably for the better. I polished the cheat modes a bit in last commit, making them count skills the same way embark does (costs 3 points to boost skill from 2 to 3). To get to the lesser cheat mode press Shift-T a few times. Cheat turns off when keepers viewscreen exits, but it remembers 'banked' skill points for when it is next activated. For unlimited points and the ability to change mind and body attributes, sacrifice a dozen shift-t presses. After this mode is activated it stains part of the theme blood red for the rest of the game... thats all. The original 'manipulator.cpp' has 7800 commits since 2009. It was about 1000 lines of code and quite neat in October. Ive added about 2500 lines of code, overall not neat but some good efficient number crunching and stuff - lots of features. I should sometime refactor and neaten it up so it can go back on dfhacks historic repo. But now it seems to be working and stable, I like to imagine its fully debugged and (almost) feature complete. edit:doh! That was the entire history of dfhack. Nice, I use the labor manager all the time and I'll definitely try it out.